EMR-DESIGN - Shaping the net to your needs! Together with you we discuss your needs and goals and define the objectives around the (re)building of your new website. Through this interview we are able to quote you an offer with a competitive price. After your approval of our offer, we start with the design phase where a graphic & webdesigner will create a design that best suits your needs and trends on the internet. Once you agree on the design the development starts. This means changing the design into various website files that your website will consist of and that will work together as a perfect website. After development the new website is thoroughly tested before it is being delivered to the customer. Testing is a vital part as you can only make a first impression once and that has to be perfect. 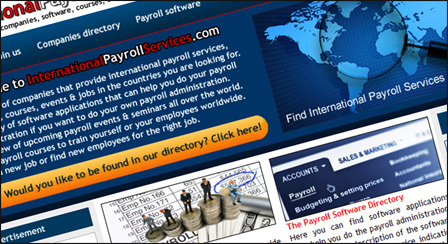 International Payroll Services.com is a website for international companies that are searching for companies that provide payroll services, software, courses, events and jobs that are all related to international payroll. They can search worldwide or in a specific region or time period. They can contact them directly to get more information about their services, software, courses, events and jobs. Fides Rae insurance Company is a captive insurance company. The company insures the risk of salary payment to the sick employee during maximum the first two years of illness. 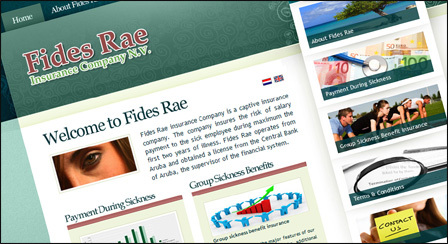 Fides Rae operates from Aruba. Fides Rae wanted a new website that looks more professional and better serves its potentional customers with information as to why they should become a customer of Fides Rae. co-founder of several other internet companies. EMR-DESIGN is always trying to deliver the best result. "We are only satisfied when our customers are satisfied." Newsletter form submitted! We will be in touch soon.